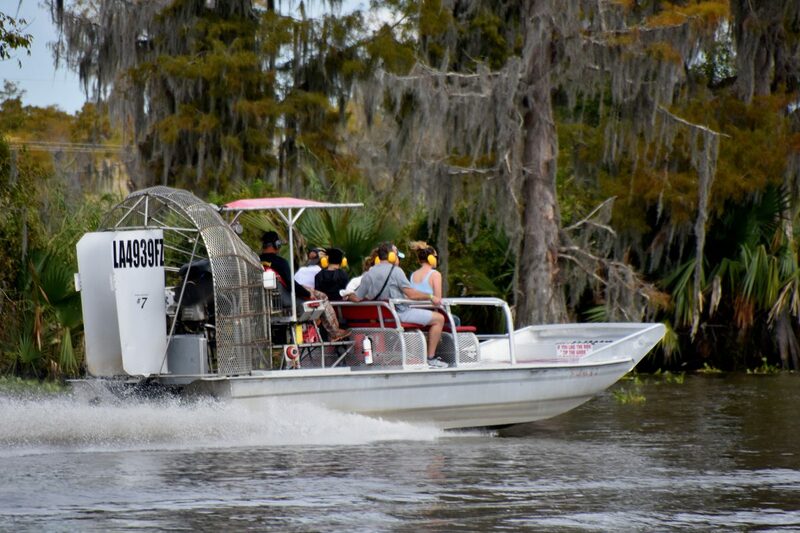 Your perfect New Orleans Airboat Swamp Tour awaits! With our fleet of on-site airboats, we can accommodate any size party. Our small boats hold 6 to 8 passengers, while the larger boats can carry 15 to 30 passengers. Contact us at 504-689-2005 for prices, reservations, and pickups. There’s a tour to fit your group and your schedule. And remember—our hotel pickup option makes your Louisiana Airboat Adventure even easier! *We offer two additional tours during spring and summer months, but it can vary each year. See the calendar on our booking page or call us at 504-689-2005 to check your date. We are approximately 30 miles from downtown New Orleans. Are you staying at a hotel in the Greater New Orleans area? We can pick you up and drop you off! (Unfortunately, we can’t offer rides to or from residential areas or Airbnbs.) Transportation pickup begins 1 hour and 15 minutes before your scheduled tour time. Please be waiting outside your pickup location, as drivers have a short window of time to pick up all guests. Be advised: Since Airboat Adventures is 30-45 minutes outside of New Orleans cab services and Uber/Lyft might not be available. Just call to arrange your pickup—it’s fast and easy! It’s fast! It’s fun! It’s the ultimate New Orleans airboat tour! Our small boat tours offer a more intimate airboat experience. They’re perfect for families, bachelor/bachelorette parties, or couples on getaways! The small boat tour costs $79 per person. Optional roundtrip transportation from Greater New Orleans hotels is an additional $20 per person. Children must be at least five years old to ride. Our large boat tours offer an awesome group experience with up to 30 of your best friends! Don’t have a huge group? You can still book this option for however many are in your party! The large boat tour costs $55 per person. Ready to have a great time getting up close and personal with the creatures of the swamp? Plan your tour today!